Pioneer Electronics (USA) Inc. Professional Sound and Visual Division answers the growing demand for combining the power of dedicated DJ software with professional quality hardware controls and sound performance with the introduction of its new DJM-T1, a high performance digital mixer featuring the TRAKTOR™ SCRATCH 2 DJ software. 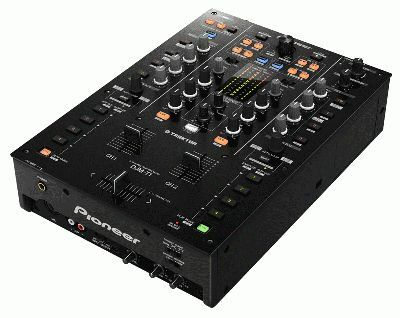 Pioneer Electronics (USA) Inc. Professional Sound and Visual Division answers the growing demand for combining the power of dedicated DJ software with professional quality hardware controls and sound performance with the introduction of its new DJM-T1, a high performance digital mixer featuring the TRAKTOR™ SCRATCH 2 DJ software. The DJM-T1 features the TRAKTOR software,high quality audio, improved fader durability and an internal USB soundcard*1 that eliminates the need to connect an external controller or soundcard. investment,” said David Arevalo, senior marketing manager, Professional Sound and Visual Division for Pioneer Electronics (USA) Inc.
panel, controls for Browse (song selection) and Transport (play, fast forward, rewind, etc.) are conveniently located on the upper section of the mixer. Performance controls such as Effect, Loop, Hot, Cue, Sampler are conveniently located on the left and right side of the mixer, providing the same look of TRAKTOR’s popular graphical user interface (GUI) for quick and accurate software operation. Each button on the mixer is designed to illuminate in sync with TRAKTOR, allowing the user to view the status of the software directly on the mixer and reducing the need to look up at the PC/Mac. Scratch Control Capability – The DJM-T1 is a TRAKTOR SCRATCH CERTIFIED mixer allowing connectivity and operation with the TRAKTOR SCRATCH 2 software for ease of use. For DJs who prefer to use their own DJ turntables, the mixer comes with a CONTROL CD or CONTROL VINYL*2 option, enabling it to be used as a TRAKTOR SCRATCH controller for scratching functions on their own equipment. In addition, the included TRAKTOR SCRATCH DUO 2 software let DJs start using the product right out of the box. High Quality Faders – Pioneer integrated new channel faders and crossfaders that feature a slide construction supported by two metal shafts for the fader knobs. The new faders provide a smooth, consistent operation, with nearly three times the durability of previous generations of Pioneer mixers. The design also better protects the faders from the harmful effects of accidental liquid spills and/or dust that might otherwise collect inside these controls. The DJM-T1’s crossfader utilizes a magnetic construction, exclusive to Pioneer, that offers extremely high durability, enabling it to withstand more than 10 million operations. The operational load, fader curve*3, and cut lag*4 can also be adjusted to the user’s personal preference. preference including DJing, recording, or production*5. The included TRAKTOR SCRATCH DUO 2 software enables them to easily record their performances from various output points with the ability to apply additional effects (i.e. Effect, Loop, etc.) to the original arrangements. 2 CD/vinyl containing timecodes for controlling DJ software. 3 Rate of volume balance change for the left and right players based on adjustment of the crossfader knob position. 4 The dead zones on both sides of the fader where there is no change in volume. 5 Requires installation of driver software and configuration utility software to your PC from the included CD-ROM. 6 Industry specifications for controlling electronic musical instruments.